NuShu means 'women's writing' and is a coded language used exclusively by women in Hunan, China to write down their private thoughts. 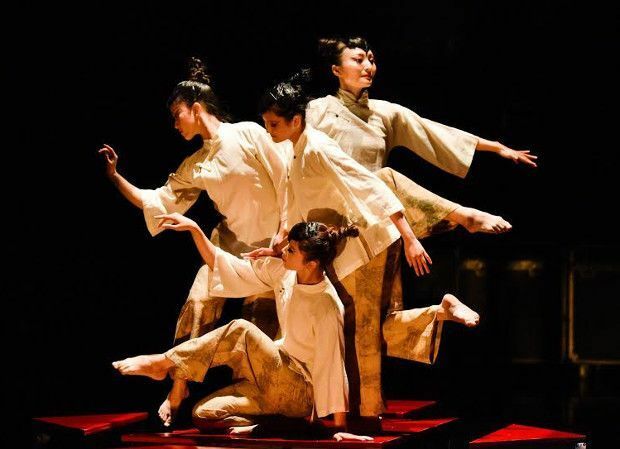 Taiwanese choreographer Hui-Chen Tan's piece of the same name translates this language into an exquisite piece of dance, centred around the memories of one wise woman. This central figure is performed with precision and grace by Tan herself, magnetic to watch, drawing details down to the unfolding of her fingers. The rest of the ensemble – three women, one man – start out in ink blue colours, pricking and curving calligraphy, letters coming to life as Tan reads downstage. But soon narrative threads begin to take shape and letters become memories. A set of plastic tables turns into a mountain to climb, children play, tussle and fight. The striking, arresting shapes of Tan's choreography mean that even when you feel the story is just beyond grasping, the momentum pulls you along. As the piece spirals to a climax, the storytellers return to black inkblots, snapping fans and carving their bodies into frenzied symbols until you feel the brushstrokes have taken on a life beyond the creator's control. Like Tan's previous Fringe piece, East, A Woman Shifting On Time Axis, NuShu is danced from both head and heart, meticulous and moving. Dance Base, until 28 Aug (not 15, 22), 3pm, £10–£12 (£8–£10).